The Kerrison family of Oakley Park built the Village Hall in 1879 as a Reading Room for the parish. The Ipswich Journal, dated Saturday 15th November 1879, reports the opening. It notes that the architect was James Kellaway Colling, who restored Eye Church, Scole Church, Oakley Church and also designed the screen in Hoxne Church. The clerk of the works was builder William Outlaw and the bricklayer was Frederick Huggins. 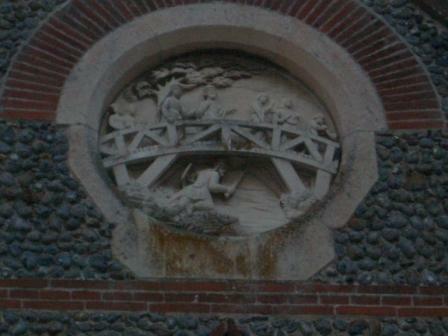 The plaque on the outside, depicting St. Edmund hiding under the Goldbrook Bridge and a wedding party passing over it, was executed by Harry Hems, a sculptor from Exeter. In 1924 the Hall was transferred to the care of the St Edmundsbury and Ipswich Diocesan Board of Finance, who struggled to maintain it and in 1962 it was sold to Hoxne Parish Council. "Opening of a Village Reading Room at Hoxne. 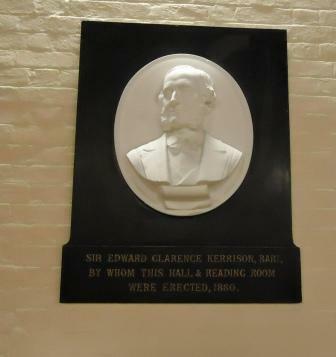 A spacious reading room, capable of holding 500 persons, was opened by its liberal donor Sir E. Kerrison, Bart., on Monday evening last. The building is fitted with every comfort, and a library is being provided which Sir Edward has most generously started with a splendid gift of 300 volumes. Sir Edward, in an interesting speech, enumerated his intentions in supplying the above, viz. as a check to Idleness, Village Gossip, intemperance etc. and to give the working man an opportunity of improving his leisure hours. Sir Edward also promised at a future time to supply a set of maps for the walls. In addition to the above a first class entertainment was gratuitously provided, professional talent being engaged, and a thoroughly enjoyable evening was spent, at the conclusion of which hearty cheers were given for Sir Edward. Neatly bound books giving an account of the life and martyrdom of St Edmund (to whom the building is dedicated) were freely distributed to the audience. It is to be hoped the villagers will duly appreciate such kindness."